One of the big concerns many people have about working at home is whether or not they get employee benefits. So many work at home options don’t offer them. That’s because companies often hire work at home people as independent contractors or freelancers, rather than as employees. Fortunately, there are also a lot of companies that have remote jobs with benefits. Not every position with a company on this list will have employee benefits. Part time positions may or may not have any, depending on the company. Your best bet for a remote job with benefits is a full time position. Your search for benefits will be much more difficult if you want to work part time. That’s true with outside the home jobs too. Companies that allow regular employees to work at home will often include benefits such as health insurance, vacation, sick days, 401(k) and so forth. These companies have come to recognize the advantages of having employees who work at home. Some companies are entirely or almost entirely virtual, so the work at home employees aren’t the odd ones out in the company. While I have done my best to be accurate with this list, you will need to review individual job postings and check with the company to see if the work at home job you are considering actually includes benefits. Temporary employment agencies and recruiting agencies will have much more than just work at home jobs available. Check with the agencies in your area to see who has remote positions available and whether they offer remote jobs with benefits to the employees they supply to other companies. Adecco is an employment agency, and some of their jobs are home based. Possible virtual positions include customer service and sales jobs. It’s not easy to find work at home jobs by searching their site, but I did see some locations. Depending on the job, you may be able to get benefits from Adecco after you’ve been placed in a position. Some positions are direct hire, using Adecco to find employees, and then I would expect the benefits to depend on the employer. CyberCoders is a recruiting agency, and some of the positions can be done remotely. Benefits will depend on the company looking for employees, but many will have them available. The main focus of the site is on technology and IT, but there are also jobs in engineering, finance, and healthcare. You can’t put all companies into just one category with the kinds of jobs they offer. The possibilities are too broad. These companies offer a variety of remote jobs with benefits. ADP (Automatic Data Processing, Inc.) offers a variety of jobs that can be done primarily from home. Many have location requirements and may require that you come into a local office at least once a week. Jobs that may allow you to work at home seem easy to find as the form allows you to select whether or not you work at a home office. Many positions have to do with sales, instructional design, and project development. What’s available will vary tremendously, of course. ADP offers a lot of perks, including medical insurance, life insurance, dental, 401(k), career development, tuition reimbursement and more. While Amazon is best known to have virtual customer service positions, they have other virtual location jobs as well. They have positions in many countries around the world. Pay attention to any location information they give you even if it says the location is virtual, as some are not home based. Amazon jobs can be very demanding, but the benefits can be good. Eligible employees can get medical benefits, a 401(k), parental leave and more. These can vary by location. Dell is, of course, best known for its computers. It has a wide variety of remote jobs available as well. Some are field based, not home based, so if you don’t want to do field work, keep that in mind as you search their job listings. Dell hires in many countries, and so benefits may vary. They generally include health and wellness, time off, and retirement plans. Xerox has people who work at home in many areas, including customer care, tech support, data entry, quality control, software programming and more. Benefits include paid holidays, health care, retirement plans and more. Customer service and sales job have been very popular with people who want to work at home. Employers can be very demanding about having no background noise audible on calls. On the other hand, many of these jobs are very flexible, which is why many work at home moms and dads seek them out. You might be surprised by how many offer remote jobs with benefits. Most virtual positions at American Express are for customer service or travel counselor positions. They take calls 24/7 and may require you to have flexible availability. As of this writing, they don’t hire in California, Alaska or Hawaii. Benefits for eligible employees may include health, dental and life coverage, paid family leave, 401(k), tuition reimbursement and more. Most at home jobs with Apple are in the customer service and technical support area. They also hire team managers and area managers at home to supervise the at home advisors. Even part time associate at Apple get benefits which include product discounts and paid time off. Asurion hires customer service representatives to work at home, and pays a premium for bilingual employees. You also get paid extra for working evenings and weekends. Performance bonuses may also be available. Benefits include medical and dental. Tuition reimbursement may be available. Convergys hires customer service agents to work at home. Some positions require more sales or technical support knowledge, but all are expected to do basic customer service. Benefits include medical, dental, vision, paid vacation, 401(k) and tuition reimbursement. Enterprise Holdings includes Alamo, Enterprise, and National rent a car companies. They offer reservation sales and customer service positions that can be done from home. Pay attention to the location listed in work at home job listings – you will probably be required to live in that area to apply. Work authorization paperwork may need to be completed in person. If you qualify for benefits, they may include medical, vision, and dental, life insurance, 401(k), flexible spending accounts, and more. Sitel work at home customer service jobs include benefits for full time employees. Benefits may include medical, dental, 401(k), vacation, and discounts from partner companies. Support.com is best known for its technical support offerings, but not all of their remote jobs are in technical support. They also hire for positions such as web developers or data engineers that can be done remotely. Benefits may include medical, vision and dental, 401(k), and paid time off. SYKES Home offers customer service work at home jobs with benefits, including vision, dental, and health. This may be good for entry level work at home job seekers, as they also list a customer service background as nice to have, but not required. If you want to sell cruise and resort vacations from home, this is the position for you. There may be occasional openings for a web developer or other positions as well. They offer health benefits and time off. Many remote education jobs require a little travel to go see your students. Others may be done entirely online. But when you want to teach, how nice is it if it’s also a remote job with benefits. Connections Academy runs online charter schools in many states. Benefits may be available to full time employees and may vary by state. K12 runs online charter schools. They offer health, vision, and dental benefits, as well as a 401(k). WGU has positions for work from home instructors, evaluators and course mentors to work from home. There are some small benefits for part time employees, such as a 403(b) retirement savings plan and tuition discount. Further benefits, such as medical and dental, may be available to full time employees. Many financial jobs can also be done from home. Not many are, so far, but there are a few companies that will let you do your job remotely. Hires people for accounting positions. Benefits include medical, dental and vision, as well as vacations and 401(k). Intuit offers work at home positions for customer service and tax support personnel. Bilingual positions are available. Some positions are seasonal, and may not offer benefits. Regular positions may also be available in human resources or marketing. You might be amazed by how many health and medical jobs can be done from home. It’s not just medical coding or medical transcription – telehealth positions allow some doctors and nurses to work at home as well. These medical remote jobs with benefits cover a wide range of possibilities, from medical coding to transcription to jobs for RNs, and more. Acusis hires experienced medical coders and medical transcriptionists. Note that positions may require a Windows 8 computer, as some clients are not compatible with Windows 10. Benefits are available to full time employees. Aetna offers quite a few work at home jobs in the health and medical fields. With a quick look, I found medical coding jobs, network manager, field case manager (significant time away from home), telephonic case manager, health coach consultant, medical director and more. Some positions will require that you visit client sites and may keep you in the field more than you are at home. Others are entirely at home. They make it easy to see if a job may offer a telework option by showing it off to the side when you search for jobs. Aetna also hires application developers and web developers, and some of these positions may be done at home. Most of their customer service positions are NOT work at home. Benefits may vary by position and can include paid time off, life insurance, health coverage, dental, 401(k), tuition assistance, and more. Altegra Health hires various types of medical coders, and many positions are remote. They require at least two years of experience for many positions. Some positions may be seasonal or temporary, and so may not offer benefits. Altegra Health offers medical, dental and vision plans, as well as a 401(k) to eligible employees. Anthem has work at home positions available for RNs as well as positions in business development, data analysis and more. Some positions require that you work in the office for a time before being allowed to transition to remote work. Anthem offers health benefits, retirement benefits, tuition reimbursement and more to eligible employees. Carenet has work from home opportunities for RNs. Benefits include medical, dental and vision, as well as gym memberships and a 401(k). Covance does clinical research, and some jobs can be done remotely. The availability of remote jobs varies significantly over time. If you want to be a part of this, you may need to keep an eye on their job listings. Career opportunities may be available around the world. Benefits vary quite a bit by location, which is to be expected in a company that operates worldwide. They include health and wellness coverage, as well as matching eligible charitable donations. HCA runs various hospitals and surgery centers. Some jobs can be done from home, such as medical coding. Benefits include medical, vision and dental, 401(k), and HCA has a partnership with Western Governors University to offer educational opportunities to affiliated employees. Humana makes it easy to find their work at home/virtual positions with a checkbox in their search form. Some positions require travel. There are a wide range of openings you can consider. They offer medical, dental, vision, and supplemental health coverage, as well as a 401(k) and tuition assistance. Lexicode is a medical coding service. It’s a part of Excela. To find remote positions, go to their careers page, and select the remote option for State and City. They offer full time employees the usual health benefits, and also offer reimbursement for continuing education, and a 401(k). Parexel offers various home based positions, mostly in the US and UK, but sometimes in other countries as well. These can include titles such as Medical Director, Clinical Operations Leader, Medical Writer, and more. Reviews posted on Indeed and Glassdoor say the benefits are good. Most insurance remote jobs will require some field time, but others can be done completely from home. While some jobs with the company can be done from home, many will involve fieldwork. A company car may be included if this is the case. Jobs that might have work at home options available include adjusters of various sorts and claims specialists. They say about 40% of their employees take advantage of flexible work and telecommuting arrangements. Benefits include health, dental, and vision, wellness programs, adoption assistance, 401(k), life insurance, and identity theft protection. Hires workers compensation claims specialists for telecommuting positions in certain states. Benefits are not described clearly on their site but are offered. Marketing is a great job to do from home, so long as you’re comfortable chatting with your coworkers online. This is a great company if you’re interested in helping companies with their affiliate marketing. You must live within driving distance of Boston, New York City, Philadelphia, Chicago, Denver, or Santa Barbara/Los Angeles. Benefits including medical and dental, 401k, paid time off, tuition reimbursement and more may be available. Many internet, software, and technology companies now offer remote jobs. It makes a lot of sense for them, as there are so many tools making it easier to collaborate with coworkers online, no matter where they are. 10up is a fully remote company that creates websites and tools for content creators. Their teams are distributed, able to work from their own home offices with flexible schedules. Benefits may include health, dental and life insurance, paid time off, professional development stipend, and 401(k). Articulate is a company that develops ways to make training easier. The company is fully remote and gives employees a lot of flexibility in how they get their work done. Benefits include healthcare including medical, dental and vision, flexible paid time off, a 401(k), a wellness benefit, and supplemental insurance. The folks that bring us great software such as WordPress also hires people to work remotely. You start out as a contract employee, but if you’re a match, it goes to full time. Benefits include an open vacation policy, home office allowance, books and conferences, parental leave, health, vision, dental, and more. Remote job titles with Chef.io may include Inside Sales Representative, Customer Architect, Business Systems Software Developer and Customer Success Manager. Jobs may include benefits such as unlimited time off, medical and dental, and paid family leave. GitHub is a place for companies to securely develop software. Remote positions for developers, technical support, and so forth may be available. Benefits include health, vision, dental, and family leave. [email protected] offers customer support positions from home, as well as project management, designer positions, and other developer positions. Not all positions appear to offer benefits, but if they are available, may include 401(k), tuition reimbursement, and health and wellness programs. Hires software developers and possibly other positions to work at home. They offer a full benefits package. Are There More Remote Jobs With Benefits? 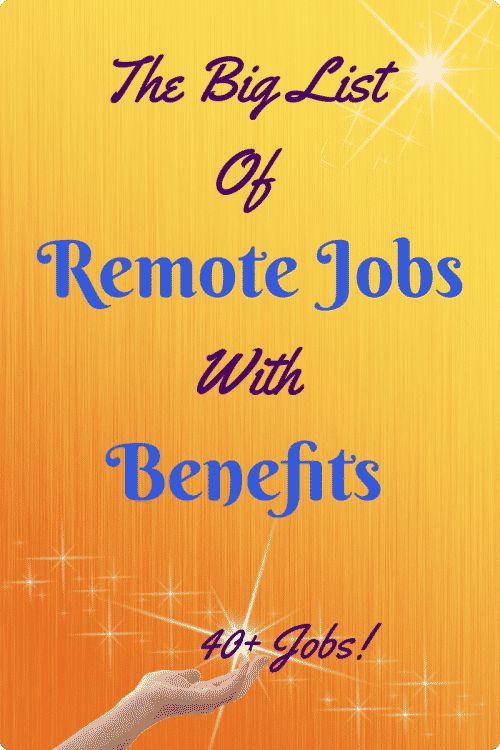 This is far from a comprehensive listing of remote jobs with benefits. Many companies don’t hire remote employees consistently enough for me to list them here. Others do, but their benefit offerings weren’t all that clear. Keep searching the listings on my remote job board for more places to look for work at home jobs.